Noam Chomsky is an American linguist, philosopher, cognitive scientist, political activist, author, and lecturer. He is an Institute Professor and professor emeritus of linguistics at the Massachusetts Institute of Technology. Chomsky is well known in the academic and scientific community as one of the fathers of modern linguistics. Since the 1960s, he has become known more widely as a political dissident, an anarchist, and a libertarian socialist intellectual. Chomsky joined the staff of the Massachusetts Institute of Technology (MIT) in 1955 and in 1961 was appointed full professor in the Department of Modern Languages and Linguistics (now the Department of Linguistics and Philosophy). As of 2009, Chomsky has taught at MIT continuously for 54 years. 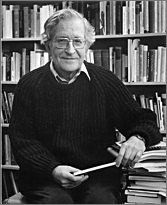 In 1967, Chomsky became one of the leading opponents of the Vietnam War with the publication of his essay, The Responsibility of Intellectuals, in The New York Review of Books. This was followed by his 1969 book, American Power and the New Mandarins, a collection of essays which established him at the forefront of American dissent. His far-reaching criticisms of US foreign policy and the legitimacy of US power have made him a controversial figure: largely shunned by the mainstream media in the United States, he is frequently sought out for his views by publications and news outlets worldwide.